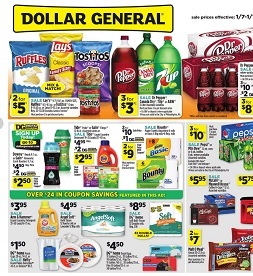 Find this week Dollar General deals, valid January 28 – February 3, 2018: 2/$5 Lay’s 9.75-10.5 oz. Family Size, Ruffles 8.5-9.5 oz. or Tostitos Chips 9-15.63 oz. or Salsa 15-15.5 oz. ; 3/$3 Dr Pepper, Canada Dry, 7Up or A&W; $2.50 with coupon Downy Beads 9.7 Oz. Or Gain Fireworks Scent Boosters 9.7 Oz. ; $3.95 Arm & Hammer Liquid Laundry Detergent; $4.95 Angel Soft Bath Tissue 12 Family Rolls Or Lavender 12 Big Rolls; $8.95 DG Home Soft Bath Tissue; $1.50 DG Home Foam Cups 20 oz./14 ct Or Hefty Foam Plates Everyday 45 ct. Or Deluxe 18 Ct.; 3/$10 with with coupon Pepsi or Mtn Dew; $5.95 McCafé Or Maxwell House Coffee K-Cups; 2/$7 Malt O Meal Cereal; $5.75 Folger’s Coffee Country Roast 31.1 Oz or Classic Roast 22.6 Oz; $2.95 Tide Simply Liquid Laundry Detergent 19-25 Load/37-40 Oz, Gain or Downy Liquid Fabric Softener 39 Load/64 oz, Gain or Bounce Fabric Softener Sheets 60 ct or Downy Unstoppables Scent Boosters 6.4 oz; $9 Kibbles ‘n Bits Dog Food; $7 with coupon Peak Long Life 50/50 Antifreeze + Coolant; and more.